Ultimate Orange is a preworkout supplement that was very popular in the 80’s and 90’s and is now back as a reformulated workout buddy. This reincarnation is designed to be a better and more potent support for muscle building and development of intense power. Here is the reincarnation of a very popular preworkout supplement 3 decades ago. Ultimate Orange has been reformulated —with harmful ingredients removed —to provide an intense boost in energy and muscle building process. This beverage would also be helpful to those who wish to build strong muscles. By taking this product, it helps you build a fitting body and will improve your workout performance. Ultimate Orange is not just your any other product since this formula contains powerful ingredients that work effectively to deliver your desired results. This will also help you lose weight by promoting the burning of stored fat. Read on to know more about the product. Soon, we will know what the ingredients are, the user reviews and if there are any possible side effects. Caffeine (100mg). Before the days of over-caffeinated pre-workouts containing 300, 400, or even 600mg caffeine per serving, pre-workouts used a more restrained approach to their caffeine concentrations. The revived Ultimate Orange employs the same 100mg caffeine/serving of the original, but don’t mistake this for any old beginning pre-workout, as there’s still more stims to come. DMAA (65mg). The 65mg dose is on the upper end of DMAA doses included in pre-workouts, notably Mesomorph (also manufactured by Hi-Tech), but coupled with the 100mg caffeine should provide for some smooth, sustained focus and motivation during your training sessions. Ephedra Extract (25mg). The ephedra extract is sure to turn some heads, but as we’ve mentioned at length several times before this ephedra extract is ephedrine-free, meaning that the bulk of the stimulatory compounds (i.e. ephedrine alkaloids) have been removed. There are some beneficial compounds still left in the extract, but really, you can consider this a high-level form of green tea extract for all intent and purposes. Hydrolyzed Whey Protein Isolate (providing 13g protein). This is great if you’re working out at a time when you don’t have tons of protein or amino acids in your system, but don’t want to go flat. QuadraCarb (Providing 16g carbohydrates). The 16g of carbs will provide the immediate surge in blood glucose your body needs to sustain performance throughout your training sessions – but most likely not enough to spill over into fat storage because you should easily be able to work all of this (and the above protein and below amino) off throughout your training session. Essential Amino Acids (2,610mg). In addition to the 13g worth of whey protein, Ultimate orange also includes 8 essential amino acids (EAAs) to ensure your body has all the necessary materials to build muscle and stay anabolic. Choline Bitartrate (75mg). A common focus booster, choline bitartrate is one of the lesser bioavailable forms of choline supplements on the market. Compared to forms such as Alpha-GPC or CDP-Choline, you need a much larger dose of this form of choline (around 1-2g) to really notice it’s focus boosting effects and stronger mind-muscle connection, due to the increase in the neurotransmitter acetylcholine. Inositol (75mg). Inositol is a pseudo vitamin naturally found in animals and plants and frequently mistaken to be a member of the B Vitamin family. It’s also an essential component of structural lipids in the body. Apart from the ingredients listed above, Ultimate Orange includes a whole slew of vitamins and minerals which incorporates a wide spectrum of essential vitamins that our body needs. Are you thinking right now that this formula could be a meal replacement or a pre – workout? Are you excited about what kick this product can give you? Well, according to studies, Ultimate Orange is back from the dead and it is considered to be one-of-a-kind preworkout formula out there in the market. Reviews from users are also noted to be mostly positive leading to the impression that the manufacturer’s claims are legit. This formula features quality ingredients that most of the time is necessary for our preworkout needs. Ultimate Orange can help you to achieve and build strong muscles and have the necessary energy for your gym hours. It was designed to deliver intense and remarkable results. This is the ideal supplement for you if you’re looking for a quality and efficient preworkout formula. In most cases, this product is only available online. For legit transactions, only visit the official and trusted retailers. DMAA (65mg). This is the ingredient that’s replacing the ephedrine alkaloids that have had to be removed from supplements in the early 2000s (and finalized by law in 2006). DMAA isn’t exactly like ephedrine, but it’s one of the closest things on the market, especially when talking about the focus and feel of it. Old ephedrine users who haven’t at least tried it once should check this new Ultimate Orange out, even if at half a scoop. Ephedra Extract (25mg). There are some beneficial compounds still left in the extract, but really, you can consider this a high-level form of green tea extract for all intent and purposes. Choline Bitartrate (75mg). A common focus booster, choline bitartrate is one of the lesser bioavailable forms of choline supplements on the market. Compared to forms such as Alpha-GPC or CDP-Choline, you need a much larger dose of this form of choline (around 1-2g) to really notice its focus boosting effects and stronger mind-muscle connection, due to the increase in the neurotransmitter acetylcholine. Inositol (75mg). Inositol is structurally similar to glucose and heavily involved in cellular signaling. Interestingly, the compound can also improve mood as it’s been shown to treat a number of neurological and behavioral disorders. Where can one buy this product? This product can be ordered from the official brand's website. How many servings come with this price? There are 16 servings. This seems like a lot less than other pre-workout supplements, but it is due to the large size scoops because of the added protein to Ultimate Orange. Since this has ephedra in it will it help you lose weight as well? It can…and since it does increase energy at the gym, you should work out harder on it. It doesn't have a lot of the ingredients that other leading fat burners have though, so I wouldn't count on this to help you lose weight as the biggest benefit. You should look at other fat burners by Hi Tech Pharmaceuticals if you are specifically looking to lose weight. This pre-workout supplement is for advanced users only. Hi-Tech Pharmaceuticals recommends that you take 1 scoop and mix it up in 8 to 10 ounces of cold water about 30-45 minutes before your workout. Do not exceed more than 1 scoop in 24 hours. Ultimate Orange hits hard but leaves you crashing hard, taste like tang. I definitely don’t think it’s worth the money there are better preworkouts for less the price. 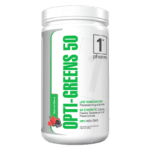 Opti Greens 50 Review: Superfoods are IN!! !